After a strong ending to September, the first weekend of October brings with it some potential box office punch, including a film with one of the year's strongest Oscar pedigrees. The Departed is a remake of a little-seen but outstanding Hong Kong detective film, Infernal Affairs. Just based on that information, you might not expect the kind of hopes for Oscars and box office that are out there, but the cast and crew are comprised of one of the strongest collections of talent in some years. The director: Martin Scorsese. The leads: Matt Damon and Leonardo DiCaprio. The supporting cast: Martin Sheen, Alec Baldwin, Mark Wahlberg, and, oh, Jack Nicholson (also, Brad Pitt and Jennifer Aniston have their names on this as producers. That must have been an awkward wrap party). The plot of the film is fiendishly clever and makes you kick yourself that you didn't think of it. DiCaprio, a hotshot detective, is assigned to go undercover in the Boston mob. Damon, a member of that same crime family, has worked his way though the Boston Police Department. Their allegiances shift and twist as they attempt to identify each other's identity while keeping their own double existences secret, with their lives very much on the line. If reviews are to be believed, Scorsese has taken this rich material and crackerjack plot and spun it into gold, with a near unanimous positive reception and many calling it his best film since Goodfellas. The plot may be near irresistible for Scorsese and gangster film fans. Combine this with a near perfect collection of actors, and this movie has the potential to be Scorsese's biggest commercial hit. 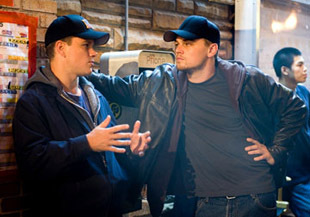 Opening on just over 3,000 screens, The Departed should open to around $27 million. Sure to give taxonomists a headache, The Texas Chainsaw Massacre: The Beginning is the sixth film in the Texas Chainsaw series, and the second since its "reimagining" by Michael Bay's production company. In October of 2003, the ultra-stylish horror film opened to $28 million, which guaranteed a second kick at the can for the new franchise. It might be getting a bit diluted at this point, as horror films have reached saturation point over the last year or so. However, that Texas Chainsaw name still means something, and even horrible looking sequels with a big name can open well using the prequel gambit (see: Exorcist: The Beginning). Where the 2003 version of the film had a couple of moderate names to help it out in Jessica Biel and Eric Balfour, this film's largest name (other than R. Lee Emery) is Jordana Brewster, best known from The Fast and The Furious. The novelty of the remake has worn off a tad as well, but the heavy promotion and established name should still carry this to around a $16 million weekend. Finally we have Employee of the Month, the weekend's new comedy effort. I use that term deliberately, since the star of the film is one Dane Cook, who falls as much into the "love him or hate him" category as it is possible for one man to be. He stars in the film as a underachieving cashier at a warehouse-style department store. He's lived in the shadow of the nearly constant employee of the month at the store, played by Dax Shepard, until a pretty new cashier (Jessica Simpson) transfers in. Rumor has it she goes for whoever holds the employee of the month title, inspiring Cook's character to work for something in his life for the first time.